Sculptural Mid-Century Modern lamp with slanted column design. Lamp is comprised of solid Lucite cylinder with asymmetrical design and heavyset Lucite base. Lucite has golden yellow or amber undertones and is fitted with and two lights, featuring on/off chain pulls. Shown with tall custom drum shade in ivory linen. Newly rewired. Great condition with one minor chip on underside of column, not noticeable to the eye. Large "Greek column table lamp" in solid Lucite by Karl Springer, American, 1980s. (Height adjustable up to 38 inches) Shade W+D: 14 inches. Mid-20th Century brass / Lucite Karl Springer style lamp, exceptional. Pair of Lucite column table lamps. Newly rewired. Off-white silk shades are included. Lamps are 31.5" H with shade and harp. Each lamp takes one bulb (not included). A pair of simply designed French Lucite table lamps, with columned uprights and square stepped bases. The color of the cable can be changed if desired. 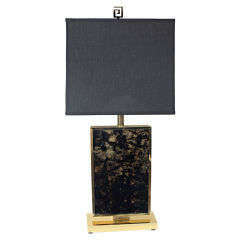 Four column Lucite lamp on square notched base capped with square notced top. Original finials of tall square shape. Clearlite by Bauer.